click on the image to see the pollen on the bee's nose! 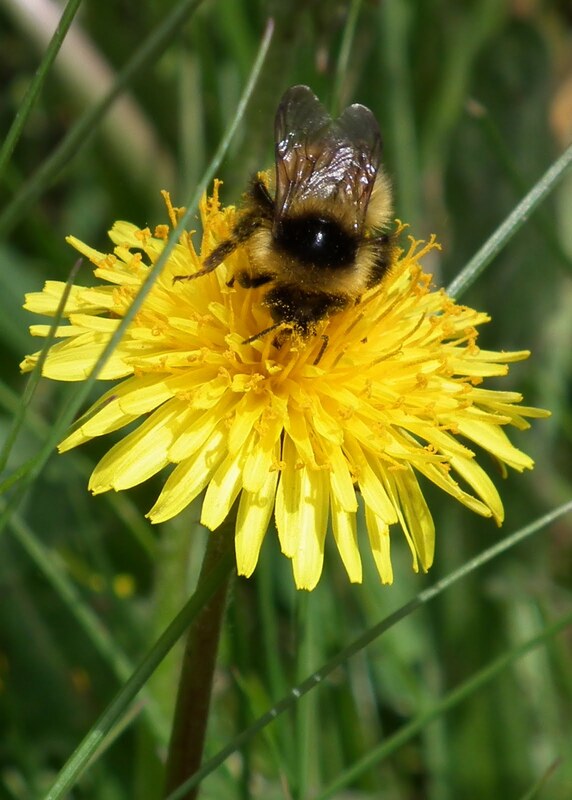 If you're considering growing food to eat, dandelions deserve a lot of consideration. They grow easily and well. To plant, all you need to do is wish on a dandelion gone to seed and blow. Nature will take care of the rest. Please pick dandelions away from roads and places where animals are walked. Also don't eat dandelions that are treated with fertilizers or weed killer. I get mine from my yard which I know is a safe place to harvest. They are super healthy. A cup of greens is higher in vitamin A than carrots, has 1/3 the amount of vitamin c recommended for a day, and a fair amount of dietary fiber. They taste good too, young, tender leaves have a faintly bitter taste that goes well in a lot of salads. Making dandelion wine is traditional for St. George's Day (link to Tarragon & Thyme), the roots can be roasted to make a tea. The blossoms are lovely floating a jar, but even better battered and fried. You can find instructions for a vegan version with photos here. Edited to add: Printable decorated version of this recipe is available HERE. My version is not vegan. I based my recipe mostly off hazy memories of being a kid and picking dandelions for my best friend's grandmother to fry for us. She used a boxed tempura batter. I made my own batter. Lots of dandelion blossoms- pick big, healthy looking heads and snap them off as close to the head as you can. Prepare the dandelions by picking off the bottom set of leaves and trimming off the bottom- I used my very clean finger nails and pinched it off, if you're fussier than I am, use a small paring knife. It's very easy to trim off too much then instead of a blossom that's easily fried, you have a nice pile of dandelion petals. Rinse and lay out to dry. Mix well and mix the liquid ingredients in with the dry ingredients. If you prefer a thinner batter, add a bit of water to make it as thin as you prefer. Heat a couple inches of canola oil to about 350 degrees, I used my electric wok, I like it for frying small things because I use less oil with it than I do with my frying pan and the temperature is so easy to adjust. 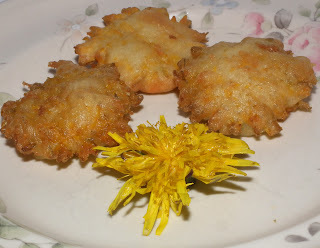 Dip the dandelion blossoms in the batter, then fry until golden brown on both sides and drain on paper towels. Now convince people they are really worth trying, because apparently people have serious doubts. Salt and pepper to taste, use dipping sauces if you like them. My son thinks these are fantastic, and they are still one of my favorite treats of summer. The reason I use the baking powder and the vinegar is that the chemical reaction between them makes a very light batter. It puffs up in the oil and it's just wonderful.